As part of its commitment to addressing gender equality, City hosted a programme of events this spring to mark International Women’s Day. This included the unveiling of a wall display in the College Building that showcases the University’s extraordinary female graduates and staff. Jessica Holland tells the story of several outstanding alumnae and the role City played in setting them on the path to their exceptional careers. City alumnae and staff have pushed boundaries in all kinds of fields. The late Dora Opoku, who was head of City’s Midwifery and Child Health department between 1995 and 2010 and chaired the East London and The City Research Ethics Committee, received an OBE in 2004 in recognition of her services to midwifery education. Professor Julienne Meyer, who leads research in Care for Older People at City and is Executive Director of a UK-wide initiative to promote quality of life in care homes, was awarded a CBE in 2015 for her tireless and visionary work. Women currently make up 56 per cent of City’s student body and the University’s graduates and staff have played a pivotal role throughout history, stretching back to the days before it had university status and its foundations as the Northampton Institute. Here is the story of several outstanding alumnae and the role City played in setting them on the path to their exceptional careers. With the encouragement of her City mentors, she wrote her dissertation on energy-saving measures at the same Sainsbury’s store she was working in. It wasn’t long before the company’s Head of Energy asked when she could start working for the department. After driving changes to cut emissions and save costs for the company, she went on to manage energy at Debenhams and then at Starbucks, where she has been employed for the last year and a half. 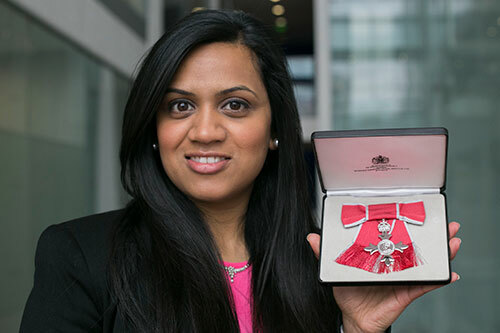 In the seven short years since she graduated from her Masters, she has also become a STEMNet STEM Ambassador, joined the board of the Energy Institute and received two industry awards. And all this was before being listed among the most recent New Year Honours and the Prince of Wales made her a Member of the Most Excellent Order of the British Empire (MBE). Like most people, I went to university without a clue as to what my career would look like afterwards, I chose engineering to keep my options open. One of Rabadia’s trailblazing predecessors in engineering was Marjorie Bell, the first female Electronic Engineering student at the Northampton Institute in 1934. Bell went on to receive a medal for her service during World War Two. In the intervening eight decades, the campus hallways have been trodden by women responsible for too many firsts to mention, in careers ranging from computing to politics. Stav Shaffir, who is 31 years old and graduated with a BA in Sociology and Journalism in 2009, was a part of City’s Olive Tree Scholarship Programme, which supported future leaders who wanted to make a positive impact on the Israeli-Palestinian conflict. She is now the youngest ever member of Israel’s parliament and has spoken out fiercely in favour of social justice, saying that “real Zionism is taking care of the weak”. Carol Sergeant, who was also awarded a CBE, in 2004, for her work in the banking sector, was the only woman on the finance elective during her MBA course at City during the 1970s. Sergeant embarked on this MBA while already working at the Bank of England. She told the Financial Times that she chose City because she could tailor her degree to give it a financial emphasis, take advantage of the University’s wide range of specialised Masters courses and because the course there could be completed in just one year. She also took advantage, she said, of the networking opportunities and the chance to use real companies as case studies several times a week. She returned to Cass Business School, as it was renamed after Sergeant had graduated, to sit on the advisory board and strategy committee. Professor Dame Wendy Hall, the pioneering computer scientist was the first in her family to go on to higher education. She then went on to create a linked hypermedia network that predated the internet, completed a degree and PhD in Pure Mathematics at the University of Southampton, before becoming interested in the emergence of personal computers and their use in education and subsequently taking on a Masters in Computer Science at City. “My career path began to move towards computer science but I didn’t want to be wholly self-taught and I wanted a qualification to help me on my way,” she says. During an appearance on the BBC Radio 4 programme Desert Island Discs in 2014, explaining how an aptitude for abstract thought had always come naturally to her, she said: “I am happier thinking in n-dimensions than I am in three dimensions.” Hall is now a Director of the Web Science Institute at Southampton, a Dame Commander of the British Empire (the female equivalent of a knight) and a fellow of the Royal Society, among many other honours and titles. The part-time MSc in Computer Science at City was the perfect vehicle for this. It was so worthwhile as it enabled me to apply for a computer science lectureship at Southampton and the rest, as they say, is history. Without my MSc I would never have got that job and would never have had the opportunities I’ve had as a computer scientist. Zaina Erhaim is a Syrian journalist and civil organiser who studied for a Masters in International Journalism at City in 2011 on a Chevening Scholarship, which is awarded to those with potential to become future global leaders. After graduating, she went on to work for BBC Arabic and then for the Institute of War and Peace Reporting (IWPR), who supported her as she returned to opposition-held eastern Aleppo to live, report and train female journalists to report on Syria’s civil war. Without her MA from City, she says, she couldn’t have got that first BBC job: “I am grateful for every and each of these steps.” In Aleppo, she faces regime snipers and barrel bombs and can’t travel without a male guardian. About a third of buildings in the city are abandoned, few people have jobs, electricity and running water are scarce and telephone and internet connections non-existent. The one road to the border is controlled by ISIS. Moving is dangerous. Living is dangerous. Nothing is not dangerous. I’m scared of being killed but I try not to think about it. Since her return to Aleppo, Erhaim has released a series of short documentaries called Syria’s Rebellious Women for the IWPR, which highlight both the horrors of war and the courage, joy and hard work of women who are part of the country’s struggle for survival. The shorts follow two community organisers and two paramedics, one of whom is also a citizen journalist, as they face the danger of bombing and capture and the conservative traditions of a male-dominated society. 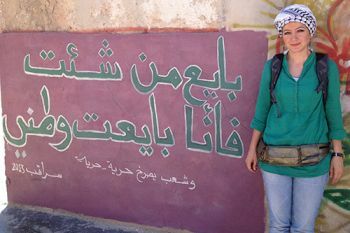 Erhaim’s work, which also involves setting up centres where women can access the internet via satellite, has been recognised with a Peter Mackler Award for Ethical and Courageous Journalism in 2015 and an Index on Censorship Freedom of Expression Award in 2016, which she dedicated to her fellow reporters in Syria. City’s Department of Journalism magazine XCity also awarded her the 2016 XCity Award for her documentation of women living amid the Syrian conflict. On first glance, Erhaim may not have a great deal in common with Professor Dame Wendy Hall, Jaz Rabadia or any of the other extraordinary women to have studied and taught at City University London, but what unites them is a refusal to accept the status quo – in particular, the idea that certain professions and areas of study are better suited to men – and an eagerness to give others a helping hand, so that they can join the conversation and become active participants in creating their future. Taking on the responsibility of becoming a role model and a mentor in this way is crucial, even in an era when female students make up more than half of City’s student body. Dame Wendy Hall’s rise to the top of her field may look smooth, but she has spoken out about the fact that she was discouraged from overreaching by people in positions of authority at every step along the way. The first time she felt she’d broken through a glass ceiling, she told Times Higher Education in 2014, was when she was appointed as the first female Professor of Engineering at Southampton, in 1994. “I subsequently found that there were many layers of glass ceilings,” she said. “Having broken through most of them, there are still barriers to break". Read about the events held at City to celebrate International Women’s Day earlier this year. See more on City's extraordinary women. for the Guardian, Vice and Al Jazeera. City is committed to addressing gender equality in representation, progression and the working environment for all staff. The University is setting equality and diversity as an institutional priority. It is committed to a workplace in which all staff are treated fairly. To achieve this, the Gender Equality Working Group (GEWG) has been established, led by Professor Giulia Iori from the School of Arts & Social Sciences. The GEWG takes forward strategic planning around gender equality initiatives for the University. Alongside Professor Iori as Chair of the Group, the team includes academic and professional staff with a broad representation across Schools, Professional Services and students. City is a member of the Athena SWAN Charter which helps the University to raise its equality and diversity profile and provides a framework on which to build on current good practice. Athena SWAN highlights that bad practice disproportionately affects women, while good practice benefits all staff. The GEWG’s aim is to improve City’s working culture and enhance excellence for all staff and students within the University.